Wow! Look at that baby! Beautiful. Yours? Yes, mine. And another one on the way! I second Dale’s wow. I’ve never seen a cactus flower that large except perhaps at a botanical garden. I feel congratulations are in order. Beautiful, Sarah–what a green thumb you must have, even in the case of succulents/cacti! Succulents and cacti adore my south-facing front room. They’re very easy to look after in that they need very little looking after. You’re not meant to water them at all from October through to March, which is good. Even in the summer, they only need a few drops of water about once a fortnight. There’s a second flower coming on that cacti in the picture, this time from the top of the plant. Very exciting. Such a wonderful show! I’ve never seen such a big cactus bloom, Sarah. You must be doing something right. 🙂 A lovely haiku tribute to it. It’s probably that I do very little, Sylvia, as I think that it’s easy to over-pamper cacti when they prefer semi-neglect! I’m so glad you like it, Swetank 🙂 That flower has brought me great pleasure, especially on grey days. Wow, I have a windowsill of cacti in the kitchen but nothing so dramatic as this one! 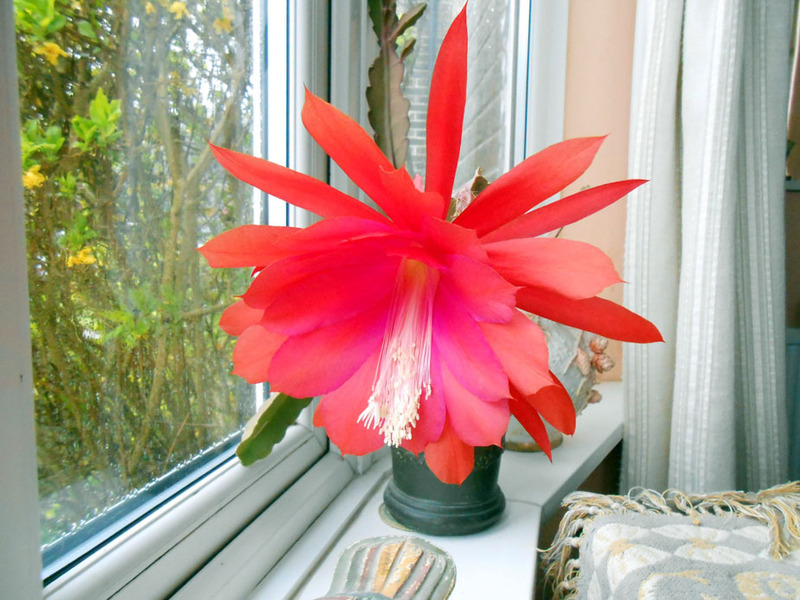 I have quite a few cacti, but this is the most dramatic and surprising flower that has ever appeared on any of them! This really was a huge blossom and had to look twice to believe it was real, Sarah. Robin, I had to look twice (and more) to believe it, when it appeared overnight!